Well, that’s it. The summer holidays have drawn to a close. Ed goes back today and the children are back tomorrow after one final inset day. The break this year has been quite jam packed, but we’ve also had some chilled out days at home to rest too. It’s been lovely, but I can’t deny I am looking forward to getting back into a routine. One of the things I have been awful at over the summer holidays is keeping on top of the washing. I tend to let it build up, and build up, until one day I am faced with a huge laundry mountain, just waiting to topple over. Then I end up doing loads of washing back to back until it’s all done. 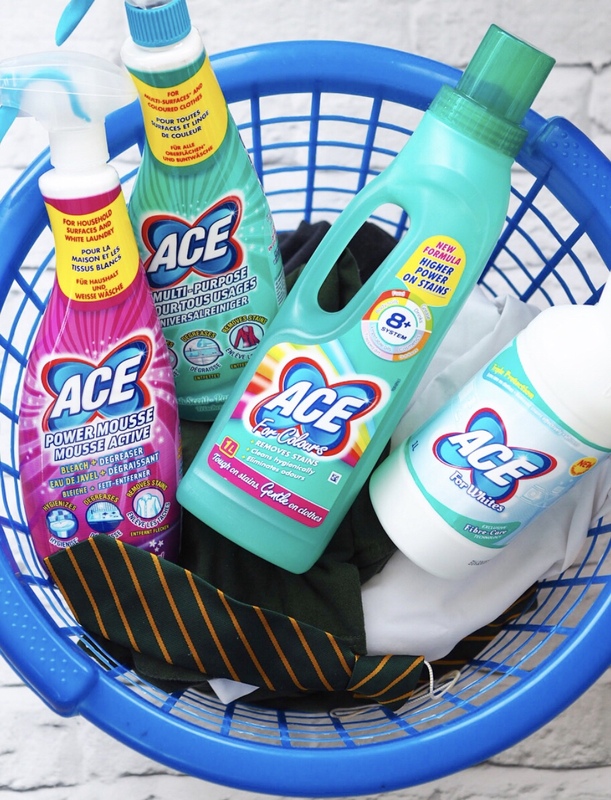 A few weeks ago I was sent some brilliant multi-purpose cleaning products from ACE, that can be used on both clothing and the home (yep, I was pretty impressed too), and I have been making an effort to use them in the lead-up to the new term. The original ACE fabric stain remover has been so useful at getting the ice lolly stains out over the past couple of weeks. Its gentle scent leaves clothes smelling fresh, and it’s one of the most versatile products I have come across, able to be used on all fabrics including silk and cashmere, as well as both whites and colours. It can be used as a stain remover on everything from food, grease, cosmetics and mud, as well as doubling up as a cleaning agent for your household surfaces! I’m a total convert since I started using this. I have especially appreciated having the Ace for Whites to hand. It will be useful once the kids start back and manage to get their new school shirts dirty! It doesn’t just work on stains, but also whitens, whilst being gentle enough to use on delicates. It can be used as a pre-treatment, for hand-washing, in the washing machine and as a cleaning agent for bathrooms and kitchens. The Multi-Purpose spray is suitable for use on stubborns stains as well as cleaning surfaces and for washing coloured clothing, like the children’s new school jumpers. Before school starts up, I’ve been using this mainly in the bathroom – it’s great at tackling the limescale that builds up around the shower, but I know it is going to come in useful when the children go back to keep their uniforms looking new for longer. Similarly, the Power Mousse is a lifesaver for quick and simple stain removing on white clothing and school shirts. It can be sprayed straight onto clothes before putting them into the washing machine and it worked really well on my new dress recently after Benjamin managed to wipe chocolate on it! Again, the mousse can also be used on hard surfaces, and has an odour masking formulation, making it perfect for use in the kitchen and bathroom to keep things smelling fresh and clean. I am looking forward to the start of the new term tomorrow and keeping on top of the house and laundry alongside working from home! I was sent the products featured, however all words and images are my own.